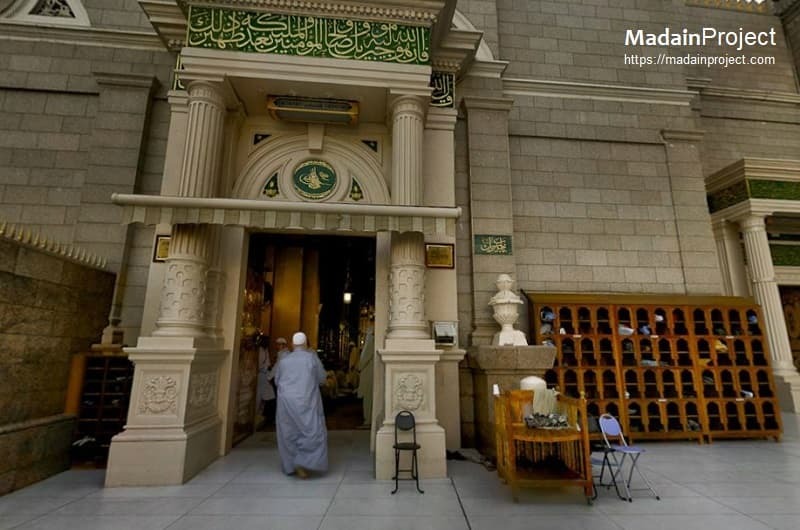 This page enlists all the gates of Masjid al-Nabawi. Original mosque of the prophet Muhammad had only three entrances, Bab ul-Rehmah to the south, Bab e Jibraeel to the west and Bab un-Nissa to the east, although back then these gates were not identified with these names. 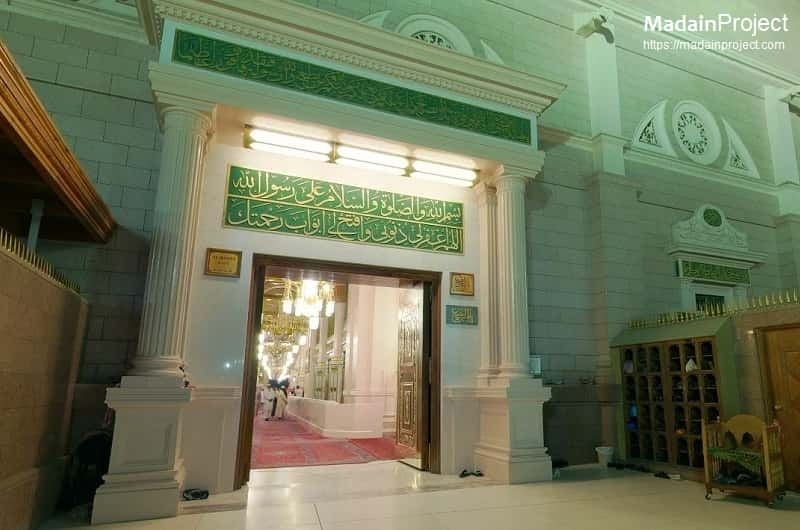 Today Prophet's Mosque has 43 gates (doors, portals and entrance ways). Each of these doors has a stone plaque above it inscribed with the following verse from the Quran: ادْخُلُوهَا بِسَلَامٍ آمِنِينَ udkhuluhā bisalāmin āminīna Enter with peace and security, [Surah al-Hijr, 15:46]. as-Salam Gate (Bab as-Salam, gate no. 1), built by Caliph Omar circa 640 CE (18 Hj.) in the western wall of the mosque. During the various extensions of the mosque, this door was also moved westward in the same line and today it is not in its original location. The Babs as-Salam means the door of peace or tranquility. Although now not in it's original location, it is one of the very first gates of the mosque. Bab e abi Bakr Siddiq (gate no. 2), according to ibn Hajr “Small door is called Khukhah” it was near the fifth column west of the pulpit. This small door opened into the mosque. This door was moved westward along the same line during the various expansions of the mosque. During the first expansion by the Saudi Government, it was named Bab Siddique. Bab as-Salam is also partially visible to the right. Bab ur-Rehmah (gate no. 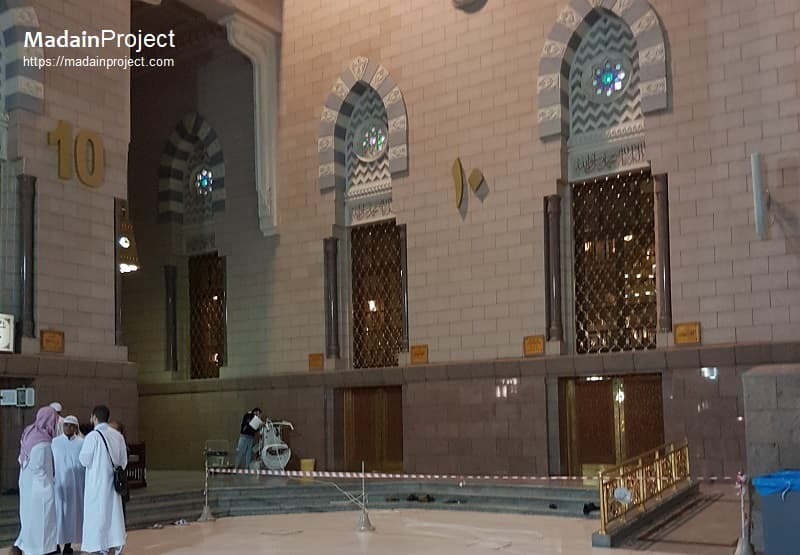 3), was originally installed by Prophet Muhammad, during the various expansions of the mosque, it was moved westward in line with its original position. Since this door was in front of the house of 'Atika bint 'Abdullah bin Yazeed bin Mu'awiyah (عاتكة بنت عبد الله بن يزيد بن معاوية), it was sometimes called Bab e Atika. Hijrah Gate, (gate no. 4), is a double (twin) arched gate. It is located to the left of the bab al-Rahmah. It is named in memory of the tradition of Hijrah of prophet Muhammad from Mecca in 622 CE. Originally this gate had only two portals, but recently two more portals were installed east of these two, bringin the total number of portals to four. Gate of Quba (Bab Quba, gate no. 5) is located towards the direction of Quba village, it is a triple arched gateway on the southern side of the mosque. 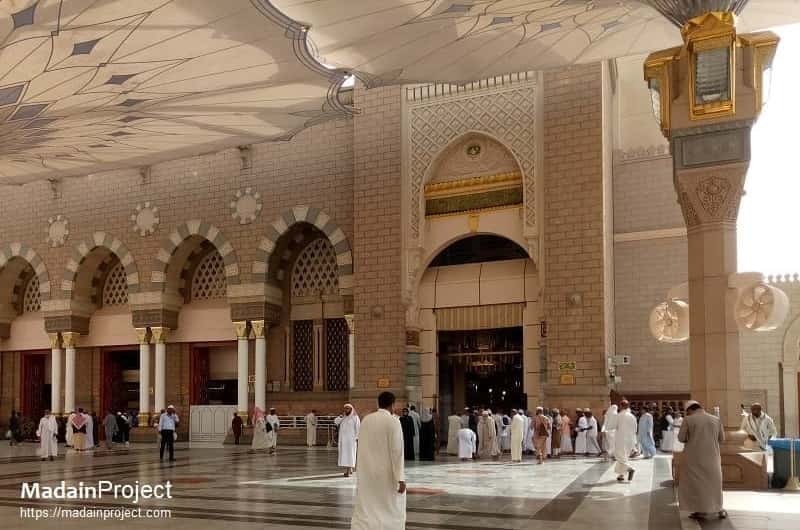 It is located on the south-western flank of the Masjid al-Nabawi's King Fahad bin Abdulaziz block. King Saud Gate (gate no. 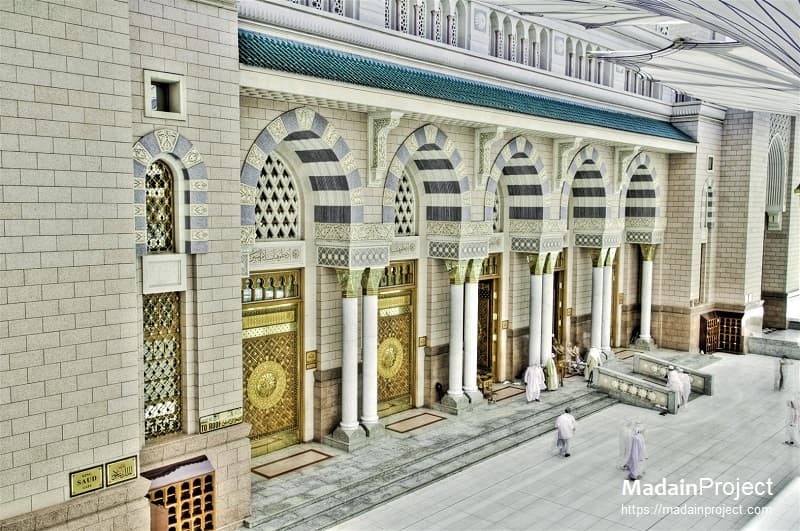 7, 8, 9), is named after Saud bin Abdulaziz Al Saud, who commissioned the first saudi expansion of prophet's mosque. The gate has seven portals in total, two large on the flanks and five smaller. It is located on the south-western corner of the King Fahad expansion. It has a single minaret on it's southern flank, which is one of the six tallest minarets of the Masjid al-Nabawi. Gate no. 10, named after Imam al-Bukhari is located on the western flank of Masjid. 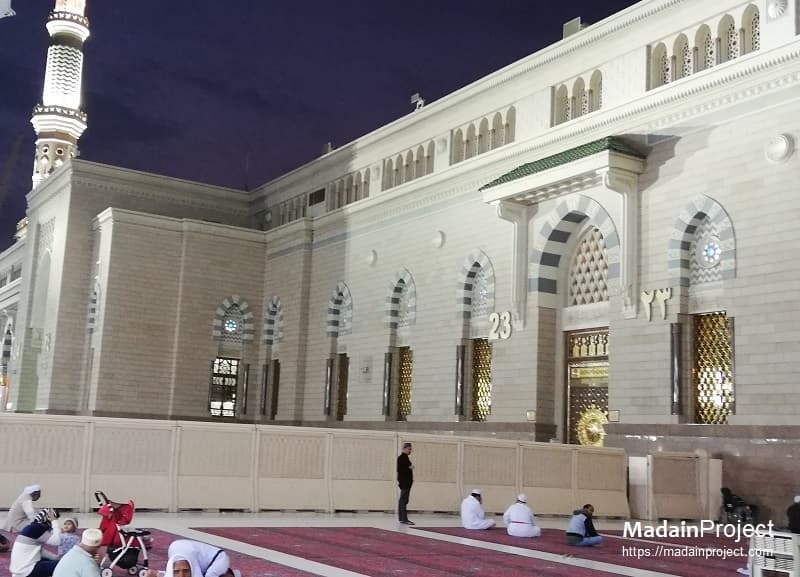 It offfers access to the Maktab ae Masjid al-Nabawi as well. It is located between the Bab e Malik al-Saud and Bab e Malik abdul Majeed. al-Aqiq gate (gate 11), mosq probably named after the wadi al-Aqeeq (وادي العقيق), west of the city of Medina. Bab al-Majeedi is located on the north-western flank of the second Saudi expansion by Malik Fahad. The Bab e Sultan 'Abdul Majeed (gate no. 12, 13, 14) also known as Bab e Majeedi was moved in the north-western corner of the Fahad bin Abdul Aziz expansion. 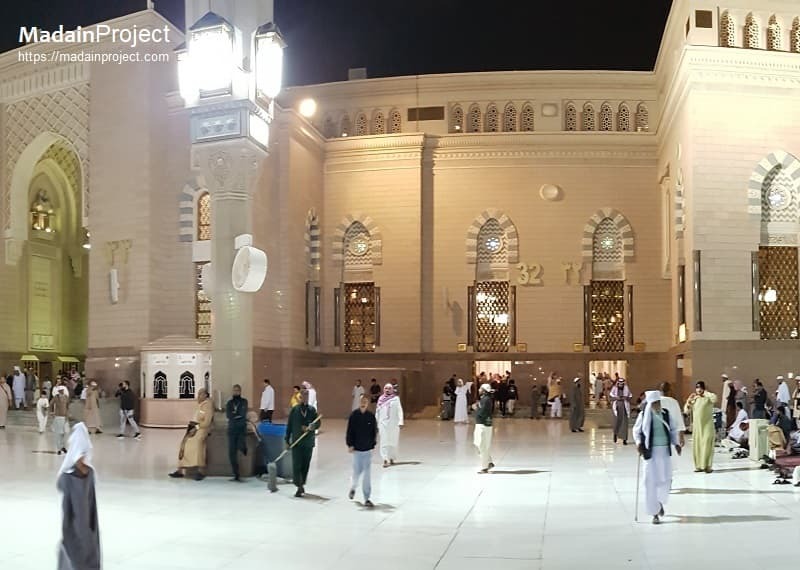 Today the gate has five smaller portals and 2 large portals and only one minaret on the southern side which merges in to Bab Omar ibn al-Khattab of Masjid al-Nabawi. One of the portals of Umar ibn ul-Khattab Gate (portal 18) (gate no. 16, 17, 18), situated on the north-western corner of the main complex, offers access to the mosque's library as well. The first Bab e Umar is located on the north-western corner of the Malik Abdulaziz expansion, but after the Malik Fahad expansion the gate on the new north-western corner was named again Bab e Umar. Badr Gate (gate no. 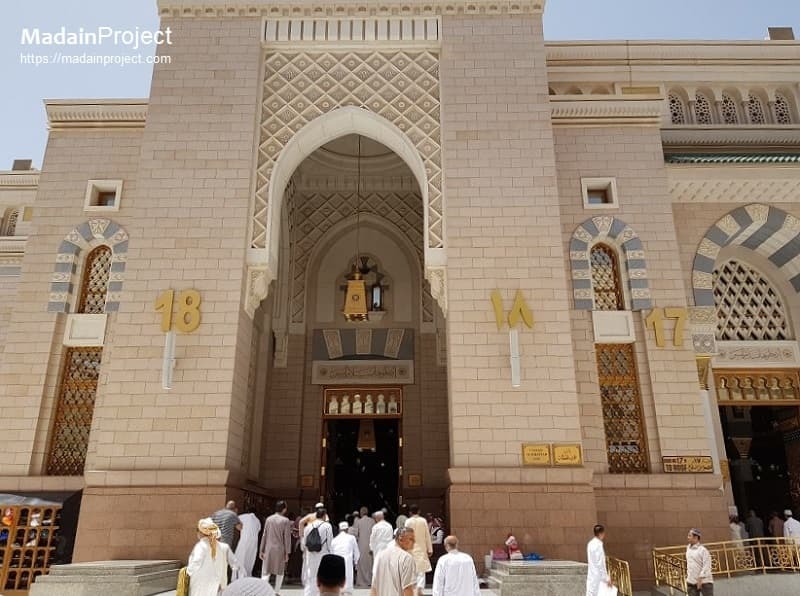 19), Bab e Badr is located on the northern flank of the mosque, between the Bab Malik Fahad to the east (left) and Bab Umar ibn al-Khattab to the wast (right). 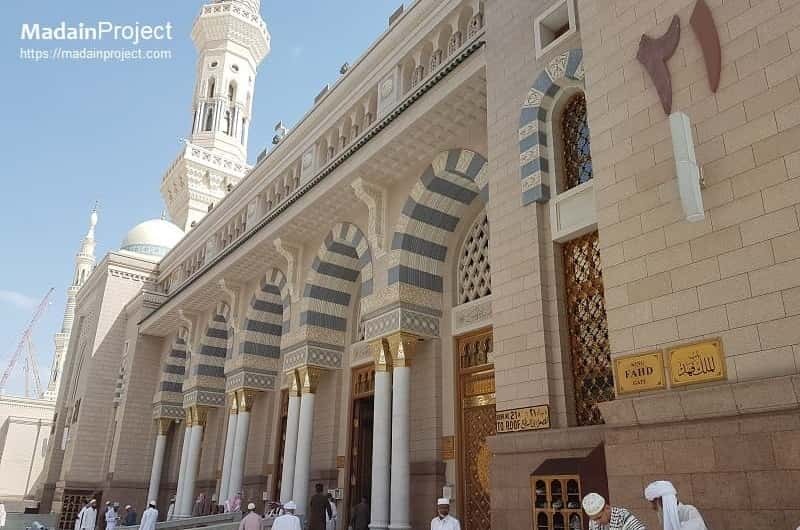 It is a single portal entrance, above the gate a verse from the Surah al-Hajar is engraved in marble, "Enter within in peace (be safe and secure)"... (Quran 15:46). King Fahad Gate (باب الملك فهد) (gate no. 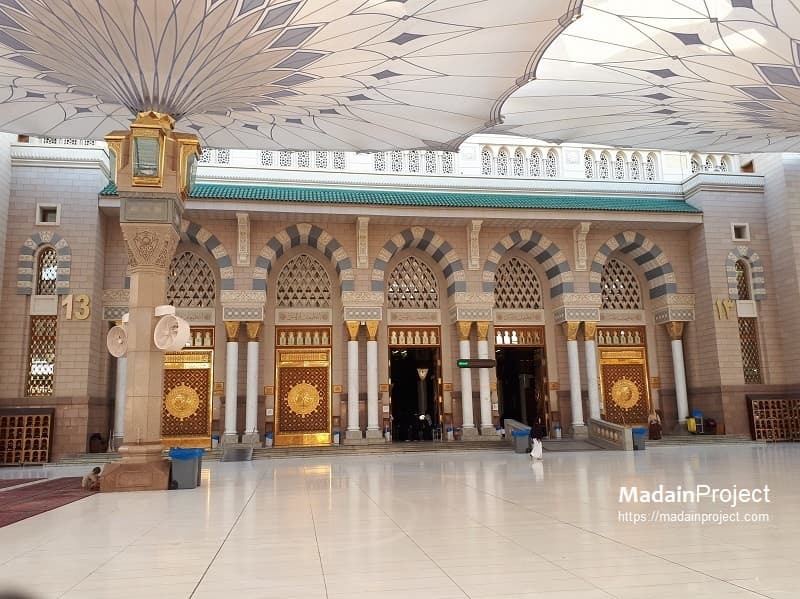 20, 21, 22), is the main entrance to the Prophet's Mosque from the north. It is named after Fahd of Saudi Arabia, malik Fahd bin Abdulaziz Al Saud, Custodian of the Two Holy Mosques, who was the King of Saudi Arabia from 1982 to 2005. Ohad Gate (بابِ احد) gate no. 23 is named after the valley of Uhud at the foot of mount Uhud where the Battle of Uhud took place between the early Muslims and their Qurayshi Meccan enemies in 625 CE. The barriers seen here are foot traffic moderators and are used only in high concentration areas of the mosque, otherwise the gates and doors are kept clear of such traffic regulators. Uthman ibn Affan Gate (باب عثمان ابنِ عفان) (gate no. 24, 25, 26), is named after the companion of prophet Muhammad who is also known as Uthman e Ghani. The gate is located on the north-eastern corner of the second saudi expansion's northern flank. With two large and five central portals it is one of the seven largest gates of the prophet's mosque. 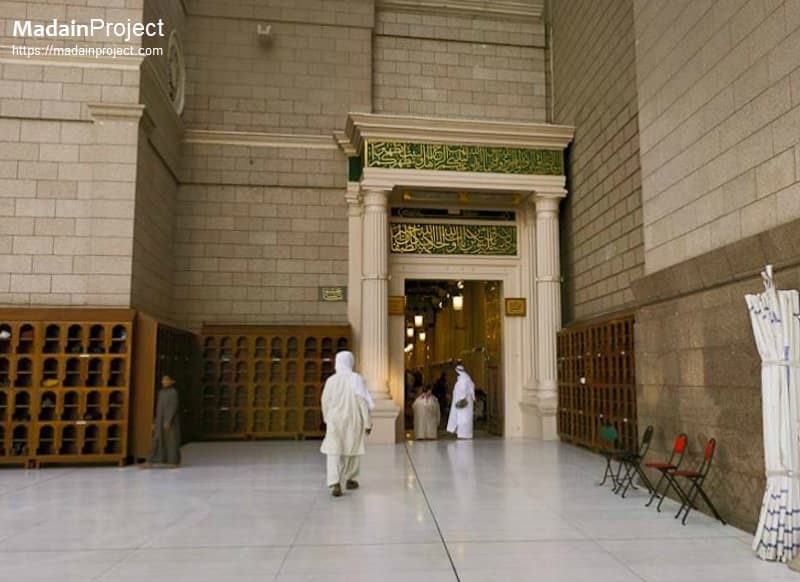 It is one of the two gates that allow direct access to the north-eastern women's section of prophet's mosque. Ali ibn ali Talib Gate (باب على ابن ابى طالب), (gate no. 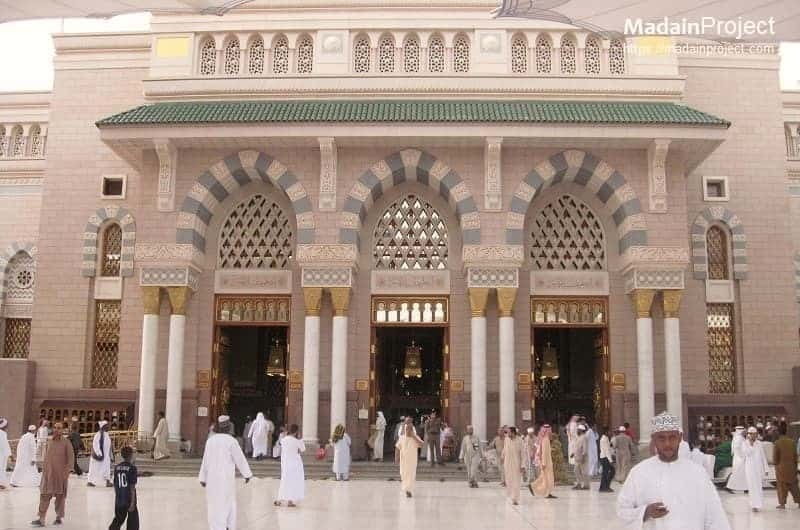 28, 29, 30) is located on the eastern flank of the masjid an-Nabawi. It is one of the largest seven largest gates. The Bab e 'Ali is named after the companion and first cousin of prophet Muhammad, Ali ibn abu Talib. abu Zar Ghaffari Gate (باب ابو زر غفارى), (gate no. 31, 32) is named after a companion of prophet Muhammad who was the fourth or fifth person to embrace Islam. Abu Dhar is remembered for his strict piety and also his opposition to Muawiyah I during the caliph Uthman ibn Affan era. The gate is located on the eastern flank of King Fahad expansion between the Bab 'Abdulaziz (left) and Bab 'Ali (right). King abd ul-Aziz Gate (باب الملك عبد العزيز) (gate no. 33, 34, 35), is one of the largest gates of the Masjid al-Nabawi. In total it has five small and two large portals for entry and exit. It is named after Abdulaziz ibn Saud. It is located on the south-east corner of the King Fahad expansion. The gate has two minarets on both sides. Makkah Gate (باب مكة, gate no. 37) is located on the southern side of the main Malik Fahad expansion building, and is faced towards Mecca so named as Bab-i Makkah. It is one of the two identical gates, other being the Bab Quba, located on the southern flank of the Shah Fahad expansion. It is a triple arched gate, conforming to the architectural patterns of first expansion. Bilal Gate (باب بلال) gate no. 38, is named after Bilal ibn Rabah al-Habashi, the companion of prophet Muhammad and the first Muazzin of Islam. Gate of Bilal is located on the southern flank of the mosque's most recent expansion by king Fahad. It is a twin portal gate with single arch over each one. Originally installed by Umar ibn Khattab the al-Nisa Gate (باب النساء) gate no. 39, was designated for the use of ladies to enter and leave the mosque premises. During the time of Umar bin Abdul Aziz it was exclusively assigned for and used by the ladies. Gate of Jibraeel (باب جبرائـﻴل) gate no. 40 also known as Bab un-Nabi, is situated to the north of Bab al-Baqi, and is known as the Bab-e Jibraeel because according to tradition, angel Gabriel used to enter Prophet's Mosque through this gate. According to Samhoudi it has been moved east-eards during many expansions of the mosque. al-Baqi Gate (gate no. 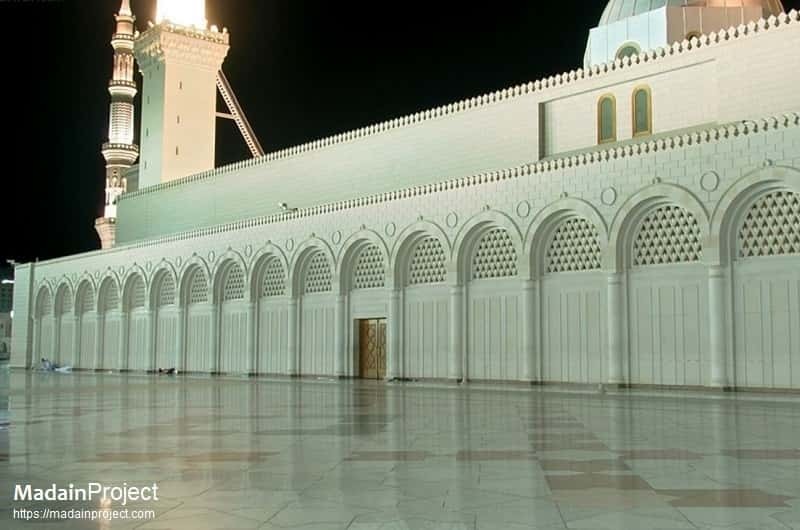 41) (باب البقيع) is located closest to the Prophet Muhammad's burial chamber, and faces Baqi ul-Gharqad. It is located exactly opposite to the Bab as-Salam and a passage connects the two. Gate of the Imams (Bab al-Aiymah also known as Bab ul-Janayez, gate no. 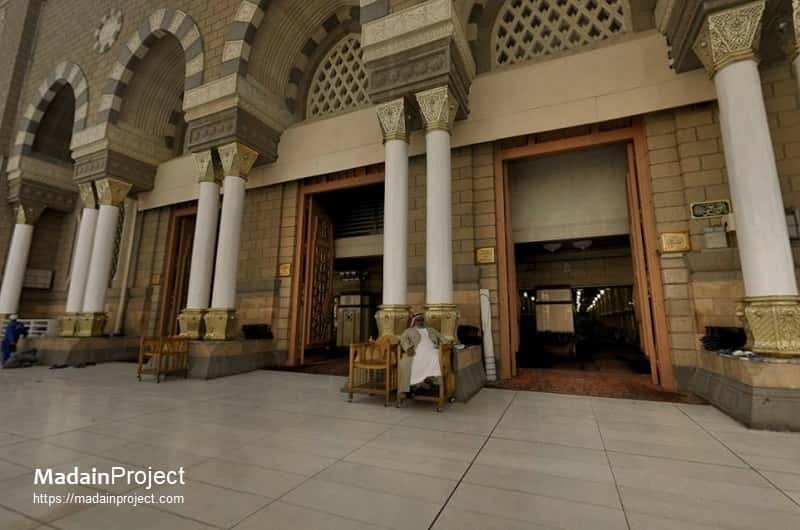 42), is a small gate located on the southern side of the Masjid al-Nabawi and allows entrance to the Rawdah Rasool section. It is mainly used by Imams and opens up closely to the Mehrab-i Uthmani, the functional mehrab of the Mosque today. Ameen, F. (2014). TASBIH BAITULLAH: Catatan sebuah perjalanan suci bersama Anak Syurga.  Retrieved April 4, 2019, from Google books. Damluji, Salma Samar, ed. The Architecture of the Prophet's Holy Mosque, Al Madinah. London: Hazar Publishing Limited, 1998. Hillenbrand, Robert. Islamic Architecture, Form Function and Meaning, 72-73. Edinburgh: Edinburgh University Press, 1994. Michell, George, ed. Architecture of the Islamic World, 210. London: Thames and Hudson, 1978.